What Is DD Form 350? DD Form 350, Individual Contracting Action Report is a document that contains information about contracts for goods and services between the private sector and the military agencies within the U.S. Department of Defense. The DD 350 is part of the Records of Prime Contracts Awarded by the Military Services and Agencies (DCADS) series along with the DD Form 1057, the Monthly Summary of Contracting Actions, which provides information on the total number of contracts issued by each of the military agencies monthly. The latest edition of this form was published and used by the U.S. Department of Defense in October 2003 and is available for download below. Form DD 350 is used yearly for reports. The cut-off date is the last day of the month for all activities using the Standard Procurement System (SPS), or the 25th of the month for all other systems. 1. Part A of the form identifies the report and the activity being reported. It should be filled completely. All four lines within the section must be completed. 9700 for all other reporting defense agencies. 2. Part B describes the transaction. It contains contract identification information, the number of the contract, its origin, order ID, the date of delivery and all data that relates to the contractor whose name and agency are featured in the actual paperwork. Enter the code that indicates the agency that assigned the contract number in Line B1B, Origin of Contract. Use Code A for contract assigned by the DoD, Code B for NASA and Code C for Other Non-DoD Agencies. Code Y - the contract meets the definition of a bundled contract and the contract value exceeds five million. Code N - code Y does not apply. Code A - Mission Critical. Code B - OMB Circular A-76. Code C - Other. Enter code C when codes A and B do not apply. Code Y - Yes. Enter code Y when at least 80 percent of the contract value is for work that is performance based. Lines B3, Action Date, and B4, Completion date require the date to be entered as a line of eight numbers. December 1, 2001, for example, must be entered as 20011201. Enter Code Y in Line B5B, Government Agency, if the contractor is Federal. Enter Code N if Code Y does not apply. Code 9 - Award under FAR Part 13. This section also includes the principal place of contract performance, the products or services provided, the total estimated value of the contract and a detailed overview of the kinds of actions described in the contract. 3. Part C of DD Form 350 reviews several areas of the contracting procedure. It summarizes whether or not the synopsis of the proposed action was transmitted and prepared, analyzes the extent competed, lists the number of offerors and offers, solicitation procedures and provides information on financing. 4. Part D must be filled unless the B5B is coded Y or if Line B13A is coded 6. Otherwise, code Part D to describe the original contract. 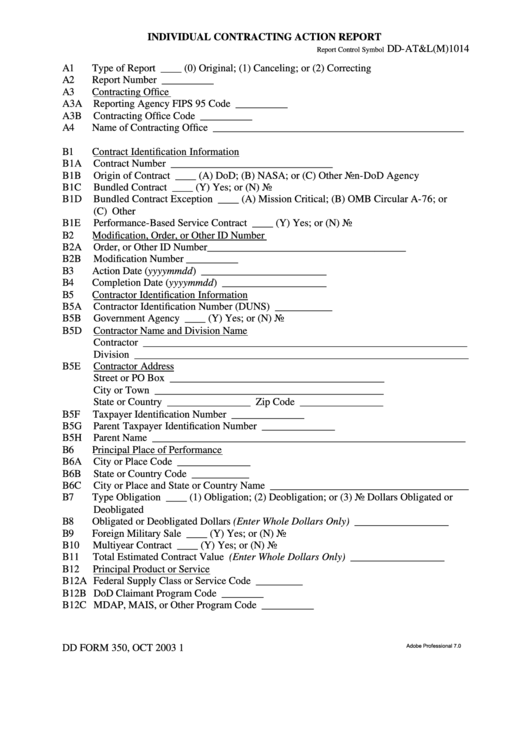 If there are no codes for the original contract because a DD Form 350 was not required at the time, the original action is no longer available, the definition of the original code has changed, or a data element has been added to the system after the original contract report, use codes that best describe the original action. See Section 253.204-70 of 253.204, Administrative matters, in Subpart 253.2 - Prescription of Forms, for a full overview of the codes required for completing form DD 350.